The San Francisco Municipal Transportation Agency (SFMTA) celebrated the completion of tunneling work for the Central Subway Project, the major extension of the Municipal Railway (Muni) Metro T Third Line. The two 350-foot-long tunnel boring machines (TBMs) each tunneled 8,500 feet to construct two Central Subway tunnels, which will allow the T Third Line trains to travel quickly beneath SoMa, Union Square and Chinatown when the Central Subway opens in 2019, cutting travel times by more than half along the busy corridor. The 750 ton, identical TBMs are named “Mom Chung” after Dr. Margaret “Mom” Chung, the country’s first female Chinese-American physician and a surrogate mother to thousands of veterans in World War II, and “Big Alma” after 19th century San Francisco philanthropist and socialite “Big Alma” de Bretteville Spreckels. Mom Chung launched in June 2013 and Big Alma followed in November 2013, traveling beneath 4th Street, Stockton Street and Columbus Avenue to excavate and construct San Francisco’s first new subway tunnel in more than 30 years. The TBMs excavated and constructed the Central Subway’s 1.5 mile-long tunnels at an average pace of 40 feet per day and will be retrieved in North Beach at the site of the former Pagoda Palace Theatre on Powell Street. 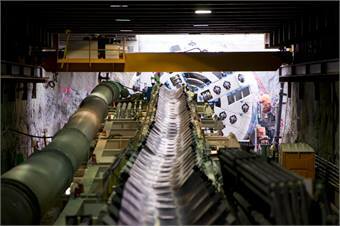 Over the next few months, both Big Alma and Mom Chung will be dismantled and removed from the tunnels to be reused in tunneling efforts in other cities around the world.